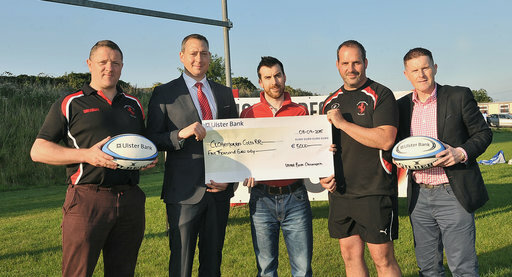 Congratulations to Claremorris Colts RFC, Connacht winner of the Ulster Bank RugbyForce and a support package of €5,000 to develop the game. Pictured: Kevin O’Malley, John Dempsey Ulster Bank Branch Manager Claremorris, Paul Cunnane, Fergal Leonard, and Jimmy Flynn Claremorris Chamber of Commerce. 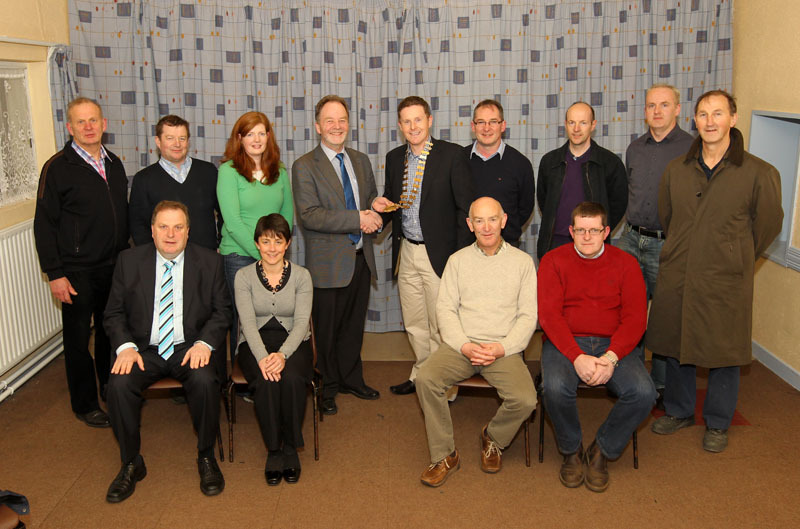 The €5,000 prize will go towards maintaining and renovating the Club Grounds at Claremount. The Colts plan to improve facilities for girls, as a lack of changing facilities means they can only offer them mini rugby just now. 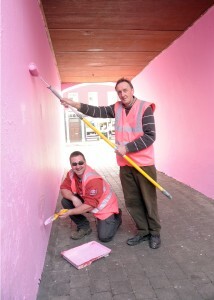 The plan is to renovate a disused building, clean and paint inside and out, and install toilets and showers. This will support a girls youth rugby programme for the upcoming season. Mayo County Council has spent at least €200,000 more than it has earned from car parking charges since 2008, shock new figures reveal. The figures, released by Claremorris Chamber of Commerce ahead of crunch talks with the Council on paid parking in Claremorris and Ballinrobe, show the local authority is on target to lose at least €40,000 this year alone. 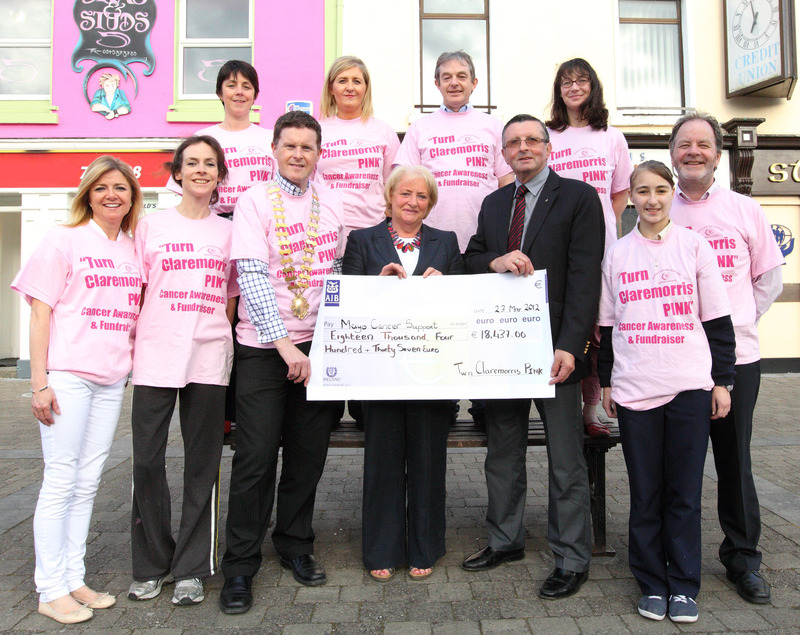 “The County Council would sooner throw town centres into an unmarked grave than admit they’re losing this money”, said Claremorris Chamber president Jimmy Flynn. “Since 2008, they’ve spent €163,000 more than they earned from paid parking. This year, a further €42,000 will be lost. That’s €205,000 wasted on collection costs in just five years”, he said. The figures were calculated from an analysis of Mayo County Council’s published, adopted budgets for 2008 to 2012. Traders in the two south Mayo towns have been battling the County Council for months for a fair deal on parking. They say giving one hour free parking on weekdays and free parking on Saturday would be like a magnet in drawing shoppers back to town centre shops. It would also help level the playing field with edge-of-town centres, which offer free parking. Leaders from the two business organisations will meet the Council this Wednesday (5 September) in an effort to settle the issue. However, they have warned that they will not hesitate to escalate their action if a fair deal isn’t forthcoming. The Christmas Lights may not be errected this year due to the serious debt and high cost of erecting and maintaining them each year. Below is an interview Jimmy Flynn, Chamber President did with the Western People on 31 July 2012. If you would like to support the Christmas Lights click on the donate button or you can lodge money into the Claremorris Chamber A/C No: 11764268 Sort Code 90-37-60 IBAN IE34 BOFI 9037 6011 7642 68 Swift Code/BIC Code BOFIIE2D. 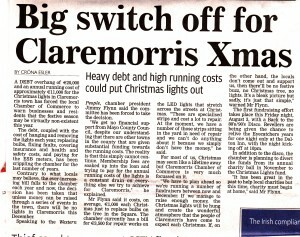 Reference Claremorris Christmas Lights and your name. Any donations are greatly appreciated. The AGM of Claremorris Chamber took place on April 3rd in the Town Hall. Mr Jimmy Flynn of Flynn’s Pharmacy was voted in as the President for the Chamber for the next two years. Outgoing President Eugene Waldron, told the meeting that it was an honour to have been President for the Chamber over the last two years and he had met some wonderful people in his role. As he presented the President’s Chain to Jimmy he wished him luck and said he believed that Jimmy would do great work for businesses and Claremorris during his term of office. Claremorris Chamber in association with ARMS Marketing conducted a survey of shoppers in Claremorris to get an insight to their perception of shopping in Claremorris and to see how we can improve their experience.